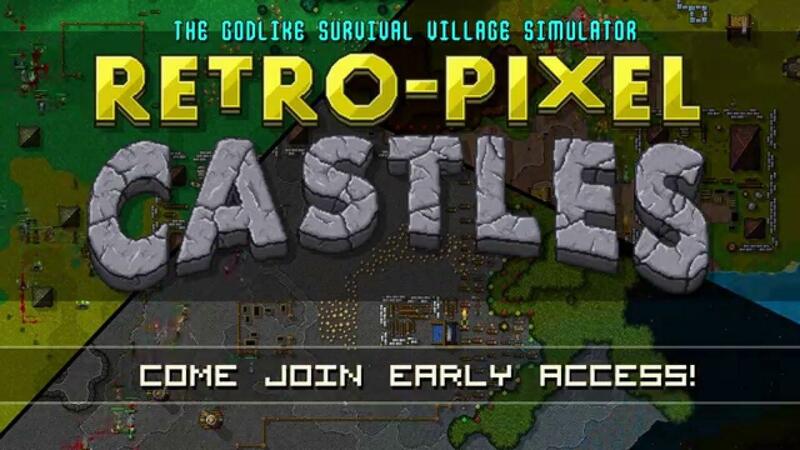 Retro-Pixel Castles [Steam, Official Site] is such a great godlike village simulator I hope more of you check it out, it's going through a constant evolution and it's damn good now. Disclosure: Original key provided by the developer. - Two buildings can now be upgraded, changing how they look and function: The first two being: your camp which can now be upgraded into an actual Castle, and the Ancillary. - There is now a cap on the amount of buildings you can have, which can be lifted through upgrades. - The Ancillary Building is also entirely new, which grants you additional building slots and a new type of worker. -Nomads can come along and attempt to join your villages now too, if they survive the journey that is. The attention to detail in this game is fantastic and it has come such a long way since the initial few releases. One thing I would really like to see are more levels of zoom. It's not a smooth zoom-in or zoom-out, as it only has a few levels. Being able to have it at the exact level I want would be a lot nicer. Minor issue: It also captures the mouse on alt+tab, not a problem if you bring up the Steam Overlay and then alt+tab, but still a minor issue. I can easily recommend this one. It reminds me of the many hours I spent in Settlers 2 when I was younger, which was rather a lot. I adore my little people and seeing buildings gradually get built is slick too. Everything about the game is so well designed graphically, it's so very cute to look at. It's damn relaxing too, watching your little busy bees work away cutting down trees, mining rock and taking down the occasional Zombie. I loaded it up today to just check that it still works okay, and I ended up putting way more time into it than I was supposed to. It's by far one of my favourite indie games right now. It is also available DRM free on itch.io. Kohrias It is also available DRM free on itch.io. The itch version is outdated. I'll have to give it another try. Last version I tried was 17 or 18, and they seem to be up to 23 now so I expect there's some big changes. Does it still only have two difficulty levels: loads of monsters or none at all? Win, win though: "Your purchase comes with a Steam key." Good news. It's a decent game but sometimes annoying. And the possibilities are too limited as for a sandbox game. However I really liked playing it for several hours.